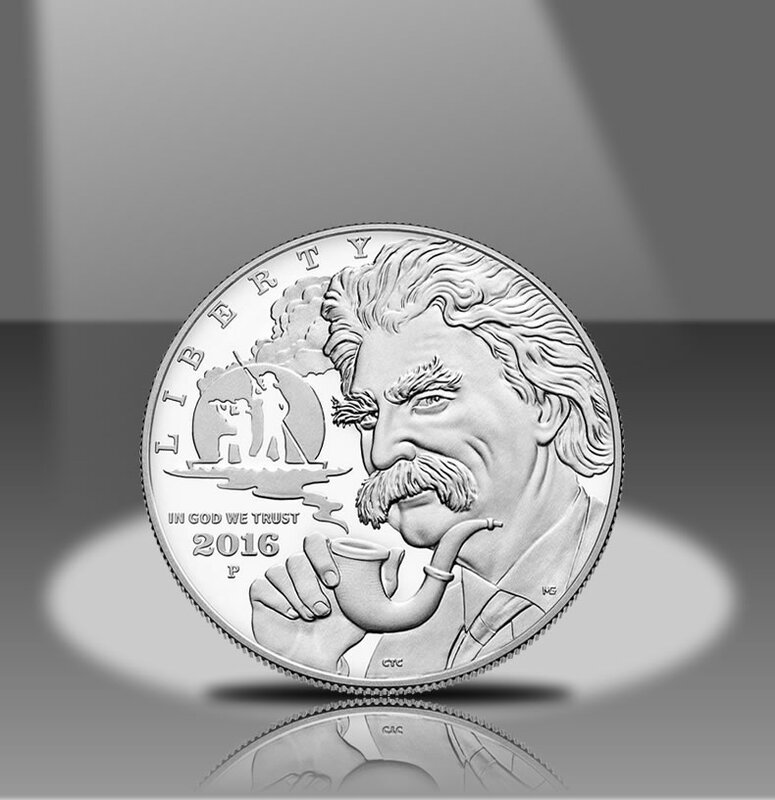 Earlier today, Feb. 1, the United States Mint started taking orders for 2016 Mark Twain Commemorative Silver Dollars. Available in proof and uncirculated qualities, these collector coins feature imagery emblematic of Samuel Clemens, the famous American author who wrote under the pen name of Mark Twain. 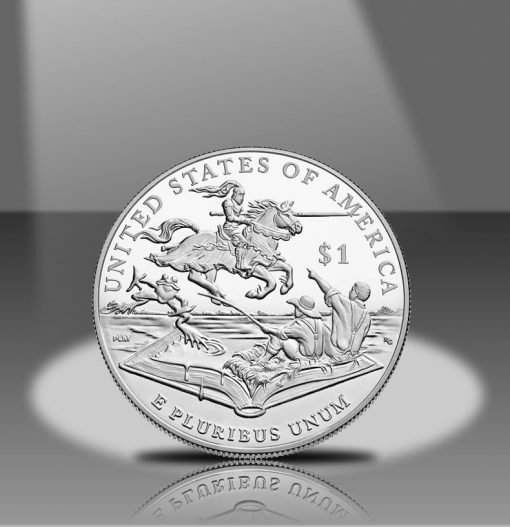 Of particular interest; the proof silver dollar features extra frosting intensities to enhance the coin’s designs. Ordering went smooth in the early going. Congress authorized a combined 350,000 coins so there was no need to storm the Mint’s online store to make a purchase out of fear of them selling out quickly. However, it is a good idea to buy them within 30 days to take advantage of cheaper prices. Introductory pricing is $44.95 for the uncirculated coin and $45.95 for the proof. Their introductory pricing period ends on March 2, 2016, at 3:00 p.m. when both coins switch $5 higher to their regular prices. These silver dollars were originally scheduled to launch about two weeks back alongside the $5 Mark Twain Gold Coins but a printing error on certificates of authenticities caused a delay in their release. 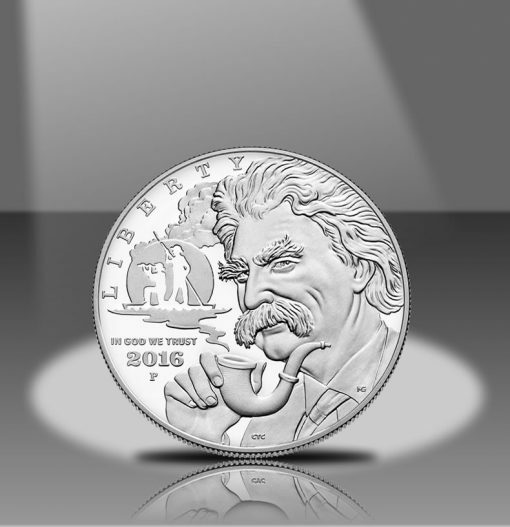 U.S. Mint Artistic Infusion Program (AIP) Artist Chris Costello created the obverse (heads side) portrait of Mark Twain with engraving by Mint Sculptor-Engraver Michael Gaudioso. Smoke rising from Twain’s pipe leads to a silhouette of two of Twain’s most famous literary characters, Huckleberry Finn and Jim, on a raft. LIBERTY, IN GOD WE TRUST and 2016 complete the obverse design. 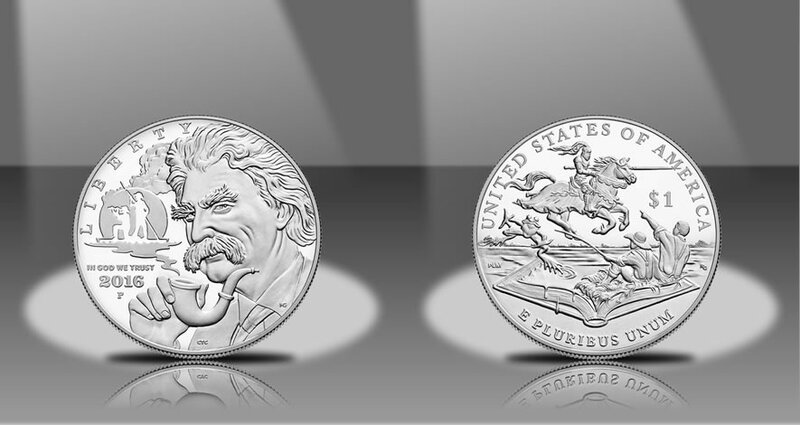 The reverse depicts characters from Twain’s works leaping from the pages of a book. Inscriptions include UNITED STATES OF AMERICA, $1 and E PLURIBUS UNUM. AIP artist Patricia-Lucas Morris designed the reverse image with engraving by Mint Sculptor-Engraver Renata Gordon. Each coin is composed of 90% silver and 10% copper with a diameter of 1.5 inches and a weight of 26.73 grams. 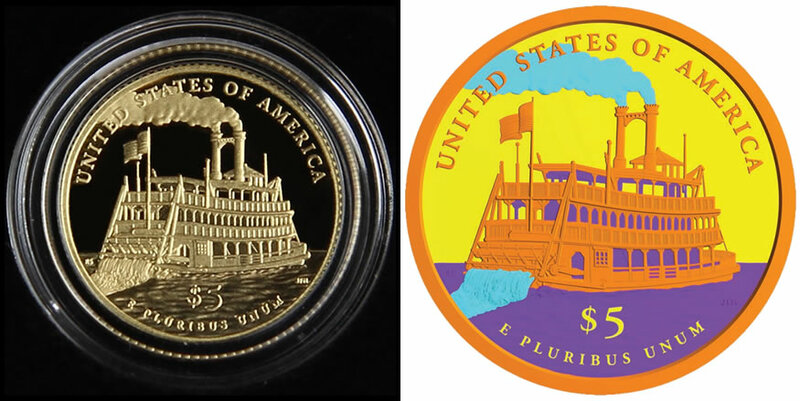 Both are produced at the U.S. Mint facility in Philadelphia and bear its "P" mintmark. Different frosting techniques appear on the proof Mark Twain Silver Dollar. 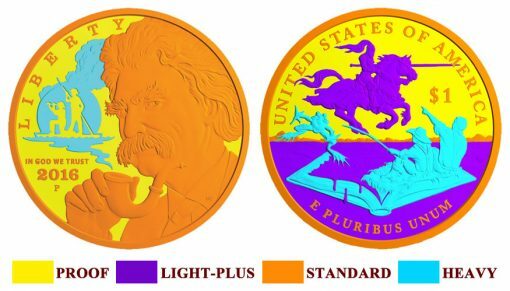 Imagery released by the U.S. Mint lists the four treatments as proof polish and the three laser frosting intensities of light-plus, standard and heavy. Proof polish and standard frosting are common to traditional proof coins. The light-plus and heavy frosting treatments offer unique combinations to the silver dollar. As shown above, the yellow is mirror-like proof polish, purple is light-plus laser frosting, orange is standard laser frosting and blue is heavy laser frosting. The $5 Mark Twain Gold Proof Coin has similar treatments. The reverse or tails side of the proof Mark Twain Gold Coin has areas that stand apart from regular proof coins, and are very noticeable with the coin in hand. Treatments shown in the illustration include: Yellow = Mirror-like Proof Polish; Purple = Light-Plus Laser Frosting; Orange = Standard Laser Frosting; and Blue = Heavy Laser Frosting. 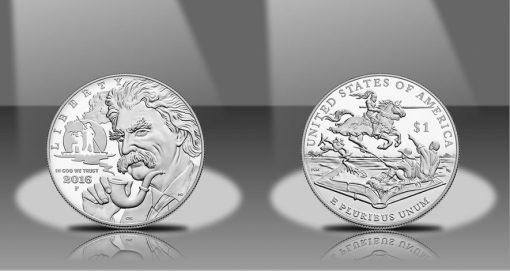 Those interested in ordering Mark Twain Commemorative Silver Dollars (and gold editions) may do so directly from the U.S. Mint’s website via its commemorative coin page or by calling 1-800-USA-MINT (872-6468). Surcharges of $35 per gold coin and $10 for each silver dollar have been added to coin prices with proceeds to be split evenly between the Mark Twain House and Museum in Hartford, Conn.; the University of California, Berkeley; Elmira College in New York; and the Mark Twain Boyhood Home and Museum in Hannibal, Mo. Hmmmm…..nice little item, but @ this price I will pass..sorry kind of a Zzzzzzzzzzz’er when it will come to resell…. They will be considerably less expensive in the after market, I’ll wait. Sorry to hear the negative responses on a coin with a “special proof finish”. Especially on a unique finish (well, the gold issue too). The design is not bad. Perhaps the pessimism comes from the number of Reverse Proof finish coins that have now been issued. Collectors have become afraid to invest in a new finish issue. Is it now to be assumed that this will be done again, and again, in the future? Somebody wake me up here. It’s a sleeper alright. I was not aware of the “surcharge scam” if the Mint does not reach their production costs. That’s too bad for the groups that do not receive any cash, and also us poor suckers who are paying what amounts to a double whammy. Seems the Mint is the only real winner here. Keep in perspective that the group of special finishes is a very small list. And it is very beautiful in finished products. If you keep updating these small issues, one day there will be a pop coin, and the rest will get a second look. Moreover, the Code talker issues, where the different techniques are being tested and proven, is all by itself in beauty. The Native Americans, long neglected and ignored, now have a source of pride in the issues, because it is so encompassing. The Mark Twain gold coins are just sparkling, and the silver dollars, if you ever read any story by Mr Clemens, are a must have!!! Thanks US mint for honoring a true character, and a premier speaker. Sometimes out both sides of his mouth, for sure. I remember reading that the Girl Scouts did not get any, And I wonder what the sales need to be in order for the organizations to get the surcharge benefit. How is it computed? Too many sneaky stuff by the Mint and unfortunately they can keep doing if because they are a monopoly when it comes to US coins and they don’t care squat about small fry collector folks likes me. Only a full fledged look-see from the Treasury and/or other gov’t agency will get the Mint’s attention, IMO..
Ronnie, I am burned out from overpriced Mint ‘offers” and when ther is a good item, the site crashes & HSN has like 40% of the mintage. About time the mint woke up, true collectors are a small group that is not being refreshed, who would buy this coin, for other than bullion value, in say 20 years>? Todays youth don’t even read books, and ebooks of Clemens seem to be absent from any bestseller list @ this time. He is GREAT, our kids are locked into electronics & instant gratification, not coins & books…..
My son did a report in the 8th grade (he’s 26 now) on Mark Twain. Now, the school district no longer allows this book to be read in school because of one word. I don’t know how it is through out the country. Maybe there is also some sticker shock since the Mint has basically kept the prices of the silver coins the same. Last year the proof US Marshal $1 was $46.95 and the unc was $43.95, This year they reduced the price of the proof MT by $1 and increased the price of the unc by $1 … go figure … when silver prices had gone down about $3 from last year.